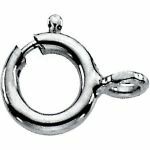 Description: 14k white gold round spring ring clasp for chains. The connector ring is opened and seamless to allow for easy attachment. Soldering seam closed is recommended. Sold individually by the piece.